WB: HeLa whole cell lysate (ab150035). Flow Cyt: A431 and MCF7 cells IHC-P: Human prostate adenocarcinoma and colon adenocarcinoma tissues. Our Abpromise guarantee covers the use of ab228466 in the following tested applications. Flow Cyt 1/200 - 1/240. Primary antibody incubation for 10 minutes at room temperature. WB 1/400. Predicted molecular weight: 47 kDa. 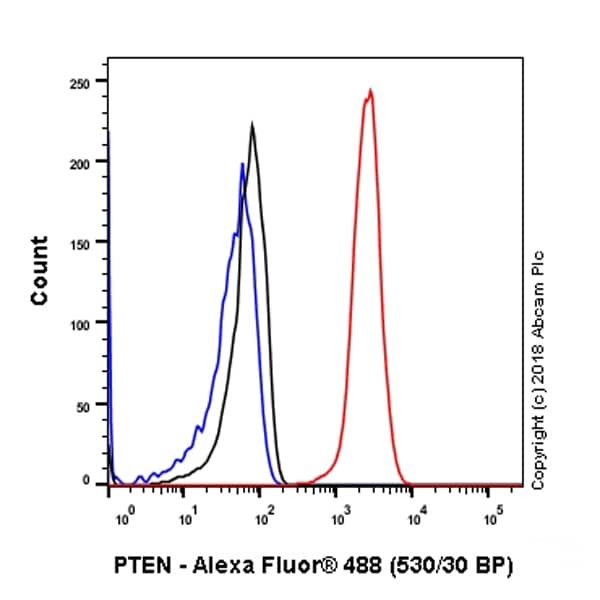 Flow Cytometry analysis of MCF7 (human breast adenocarcinoma epithelial cell) cells labeling PTEN with purified ab228466 at 1/240 dilution (1.01 µg/ml) (red). Cells were fixed with 4% paraformaldehyde and permeabilised with 90% methanol. A Goat anti rabbit IgG (Alexa Fluor® 488, ab150077) secondary antibody was used at 1/2000 dilution. Isotype control - Rabbit monoclonal IgG (ab172730) / Black. Unlabeled control - Unlabelled cells / blue. Formalin-fixed, paraffin-embedded human prostate adenocarcinoma tissue stained for PTEN using ab228466 at 1/200 dilution in immunohistochemical analysis. Flow cytometric analysis of A431 (human epidermoid carcinoma cell line) cells labeling PTEN with ab228466 at 1/200 dilution (green) compared with a negative control rabbit IgG (blue). Cancer cells from prostate adenocarcinoma (panel A) and colon adenocarcinoma (panel D) show total loss or diminished expression of PTEN when SP218 is used. In contrast, nuclear staining (panel B and C, arrows) in cancer cells is present for clones D4.3 and 138G6. Diffuse cytoplasmic and stromal staining are prominent for clones D4.3 and 138G6. But interestingly, the stromal cell components (fibroblasts, lymphocytes, and endothelial cells) are stained with similar intensities across all images. This suggests that there is non-specific staining in stromal and cancer area with clones D4.3 and 138G6 when compared with SP218. Formalin-fixed, paraffin-embedded human colon adenocarcinoma tissue stained for PTEN using ab228466 at 1/200 dilution in immunohistochemical analysis. Publishing research using ab228466? Please let us know so that we can cite the reference in this datasheet. There are currently no Customer reviews or Questions for ab228466.